Lifting and tightening by threads is a minimally invasive method by which we achieve lifting of the skin on problematic areas without surgical removal of surplus skin and fat tissue. The effects can be seen immediately after the treatment and the maximum is achieved after 3-6 months. The effect lasts up to 2-3 years. Patients after the treatment look younger and more nourished without a face lifting surgery. Fillers are substances that have multiple roles, starting from treatment of facial rejuvenation, through lip augmentation to filling of wrinkles. 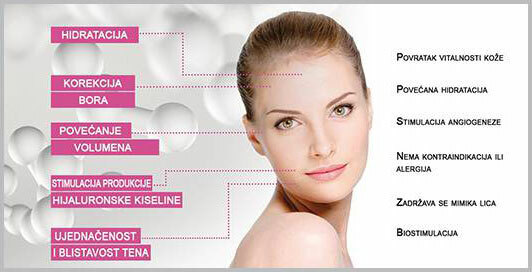 Hyaluron-fillers represent the Hyaluron acid in a form of a gel. Hyaluron acid is a component of all organisms, and over 50% of it is found in the skin. Strong bonding of water is one of the characteristics of hyaluron acid. Hyaluron-fillers can be injected into all regions of the face, and besides the face, they can find their place also in the treatment of the neck area, decolletage or hands. The results last from 6 months to a year. The procedure of facial rejuvenation with platelet-enriched plasma is a revolutionary, all-natural procedure with amazing results of facial and skin rejuvenation. It is based on applying plasma in the regions which are being treated. The most important advantages of the procedure are the use of blood plasma, which is a natural component of the organism, painlessness, instantaneous recovery and lasting results.